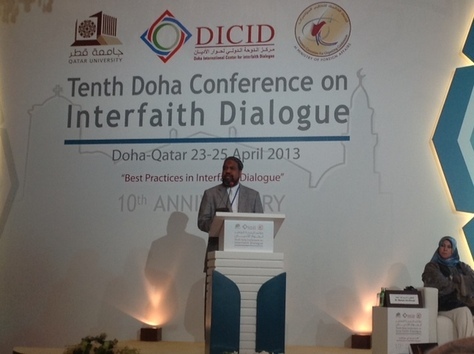 (April 30, 2013) Last week, ISNA leadership traveled to Doha, Qatar to attend the 10th annual Doha International Conference for Interfaith Dialogue (DICID). The theme of the conference was “Best Practices for Interfaith Dialogue,” and ISNA President Imam Mohamed Magid spoke about the work of the American interfaith community to support American Muslim communities. He drew from his personal experiences being welcomed by Jewish, Christian, and Hindu families when he moved to a new neighborhood in Virginia. He explained how synagogues and churches have hosted his own community for Jummah and taraweeh prayers. He also spoke about their work at a national level, in which 28 religious, faith-based, and interfaith organizations gathered together in 2010 to form the campaign Shoulder-to-Shoulder: Standing with American Muslims; Upholding American Values. Imam Magid shared how these organizations contribute their own funds to support the campaign, speak out frequently against incidents of anti-Muslim sentiment, and work with local Jewish and Christian communities to help support Muslim communities at a local level. ISNA and the Doha International Center for Interfaith Dialogue publicly committed to organizing an international meeting this year on interfaith dialogue, religious freedom and citizenship. The meeting would serve as part of what is called the “Istanbul process,” the movement to implement the United Nations Human Rights Council Resolution 16/18 on combating violence, discrimination and intolerance on the basis of religion or belief. It would also continue ISNA’s work to advance religious freedom and the rights of minorities in the Muslim world. The DICID announced this meeting in its final declaration at the end of the conference. 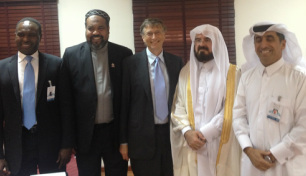 While in Doha, ISNA leadership also had the opportunity to meet with Bill Gates of the Bill & Melinda Gates Foundation, who shared his plans to eradicate polio worldwide by 2016. Unfortunately, he has encountered a great deal of resistance in some countries, namely Nigeria, Pakistan, and Afghanistan. Some people believe conspiracy theories that the vaccine is contaminated, and so they prevent the vaccines from being administered. Some of Gates’ health workers have even been killed. He is concerned that these suspicions will make it difficult to fully eradicate the disease. The International Union of Muslim Scholars and the DICID agreed to coordinate with the Gates Foundation to convene Muslim leaders in these regions and help dispel misinformation about the vaccine. Imam Magid and other ISNA leaders joined Ambassador Rashad Hussain, President Obama’s Special Envoy to the OIC, for a meeting with Dr. Ghaith bin Mubarak bin Imran Al Kuwari, Qatar’s Minister of Endowment and Islamic Affairs. Ambassador Hussain briefed Dr. Kuwari about his work. Imam Magid then described ISNA’s work on religious minorities’ issues. Dr. Kuwari was delighted to hear about this work and pledged his support, noting that it directly contributes to Qatar’s vision.